BETTER PRODUCTION MMS FEBRUARY 2018 102 mmsonline.com GE AR MAKING The transfer line starts when the blanks, which weigh between 6 and 40 kilograms, are placed on a conveyor system with a gripper that automates passage through the entire transfer line. The automation system reduces manual work because the parts do not have to be moved or stored in between machining steps. It takes the blanks to the first machine, where they are cut to length and centered. The machine has two f lexible crown turrets with an HSK 63 interface for rigid- ity and drive power, while the centering clamps hold the workpieces with a wide clamping range to reduce the need for retooling. 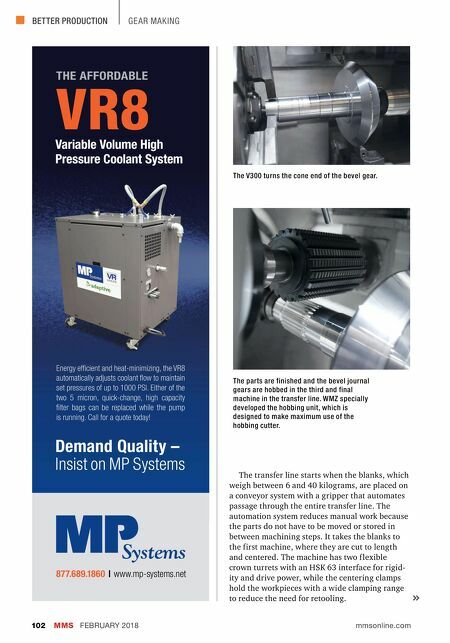 VR8 THE AFFORDABLE 877.689.1860 | www.mp-systems.net Energy effi cient and heat-minimizing, the VR8 automatically adjusts coolant fl ow to maintain set pressures of up to 1000 PSI. Either of the two 5 micron, quick-change, high capacity fi lter bags can be replaced while the pump is running. Call for a quote today! 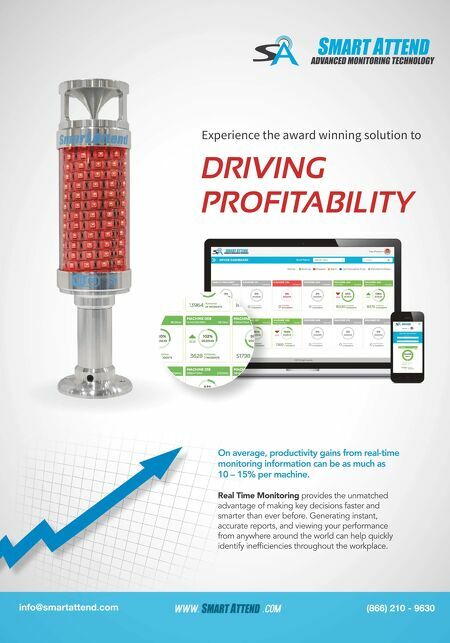 Variable Volume High Pressure Coolant System Demand Quality Ð Insist on MP Systems The V300 turns the cone end of the bevel gear. The parts are finished and the bevel journal gears are hobbed in the third and final machine in the transfer line. WMZ specially developed the hobbing unit, which is designed to make maximum use of the hobbing cutter.